Last week we introduced you to the beautiful kitchen and dining room in our first house (Flippin' the Kitchen and Dining Room I). This week, we're going to see the complete and utter destruction of this space, and then just a small amount of rebuilding. First, we destroyed the kitchen. 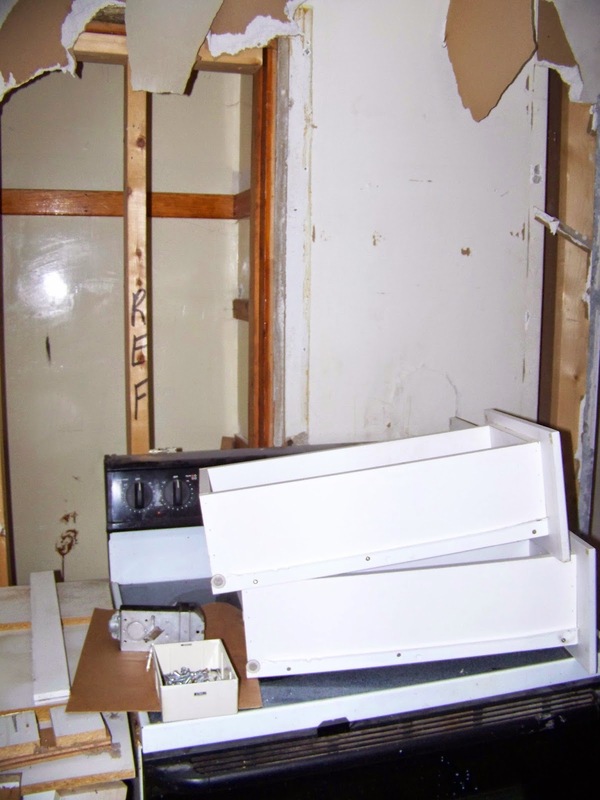 All of the cabinets were taken out (they were pretty disgusting), and all we saved was the refrigerator and one upper cabinet. When we pulled it out of its space, we noticed that there was a void we didn't know about in the kitchen. 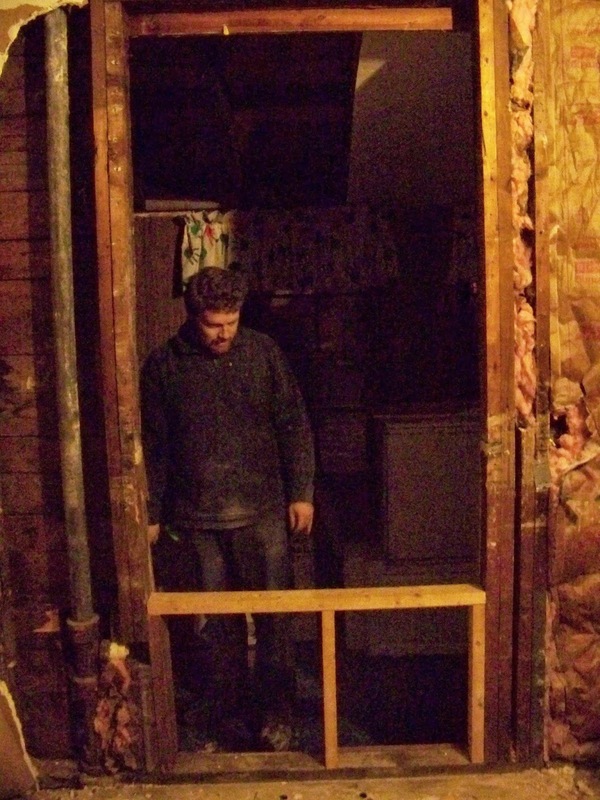 After tearing out the Sheetrock, we found what was the original pantry. 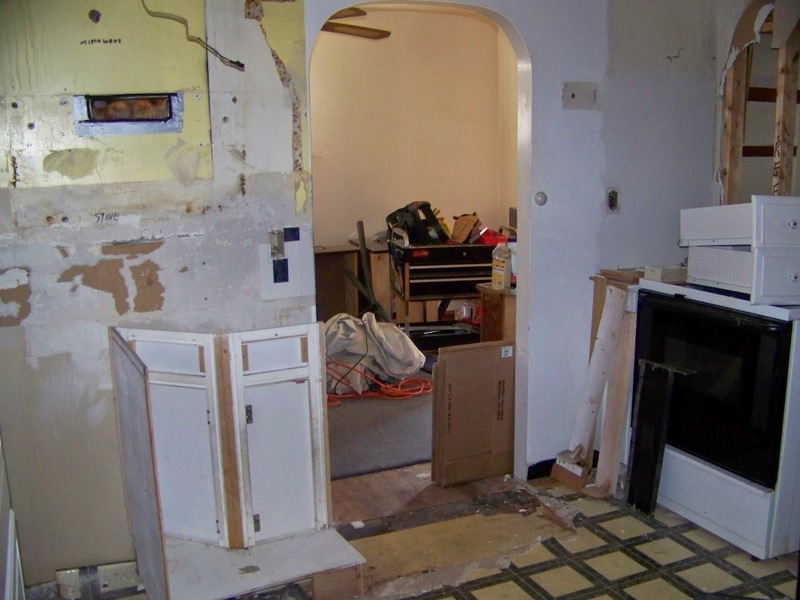 It was nestled in next to the chimney, but when the previous owners decided they needed a bigger refrigerator, the only thing they could do was lose that square footage and close up the space. 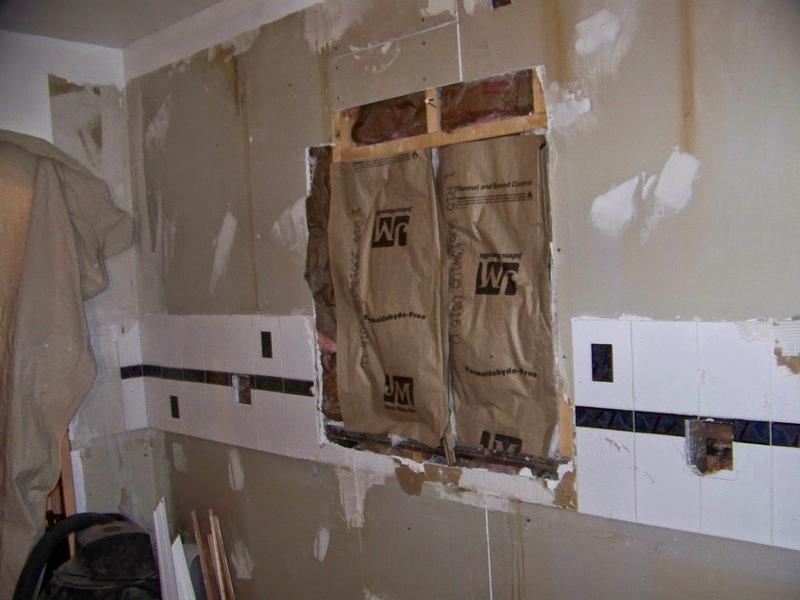 Now, I'm not suggesting that these 3 square feet would have made the kitchen feel open, but it certainly didn't help! And now a view into the dining room (you can see the mystery pantry on the far right). 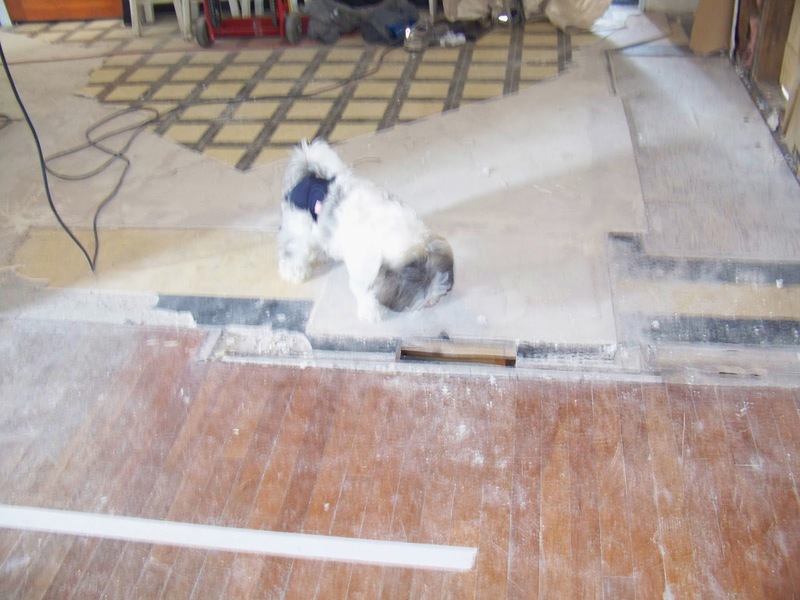 We even tore up the cheap linolium, only to find tile layer on tile layer on a layer of cement so we ripped up everything down to the subfloor. Next week we'll start with the floors as the reconstruction begins . 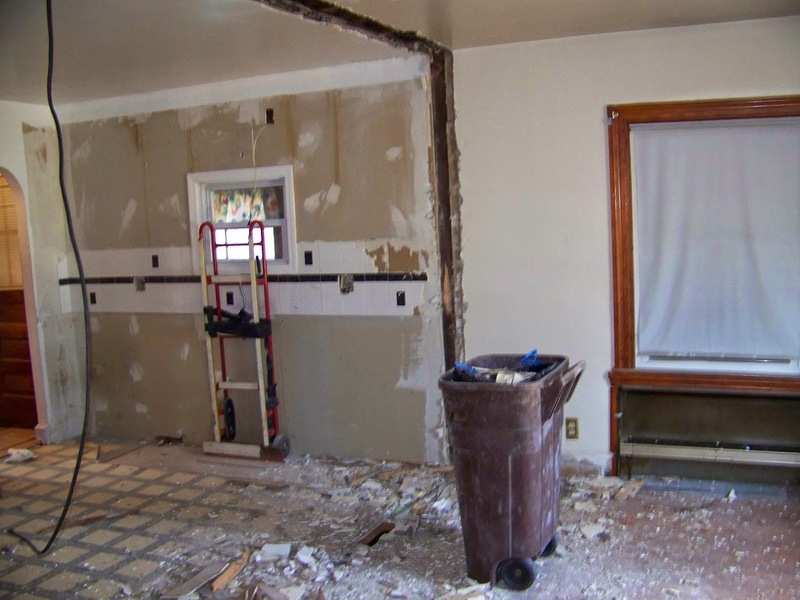 . .
After we cleared out everything in the kitchen, We took our first major construction leap and took the wall between these two rooms down! The space felt SO open, it was really refreshing. But there was a dangling wire, which looks like it puzzled me. And here's a view from the old dining room back toward the old kitchen. 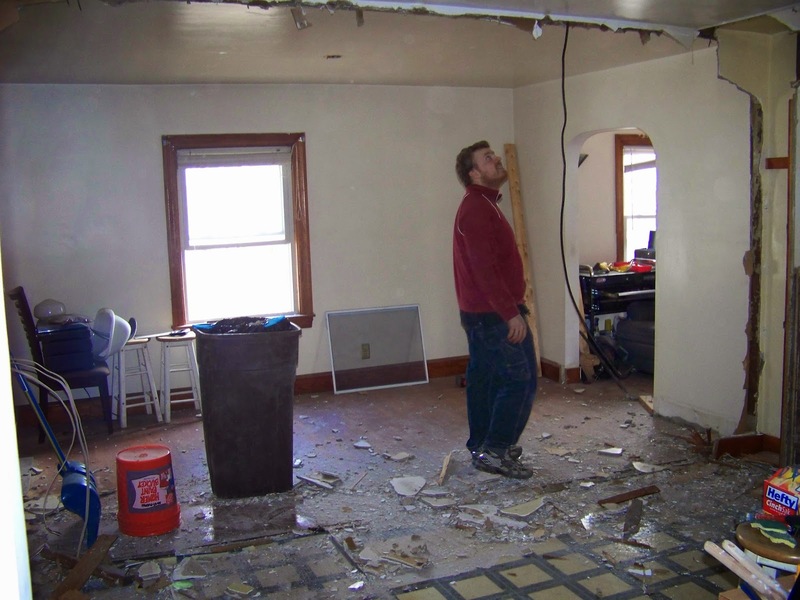 The space was now a blank canvas, and we wanted to rebuild it correctly. Now that the kitchen and dining room were one space, we wanted them to feel that way. And having a really small window in the middle of the wall was awkward. So a plan was hatched . . .
On the wall in the old dining room opposite the kitchen, there was a matching window to the large one. 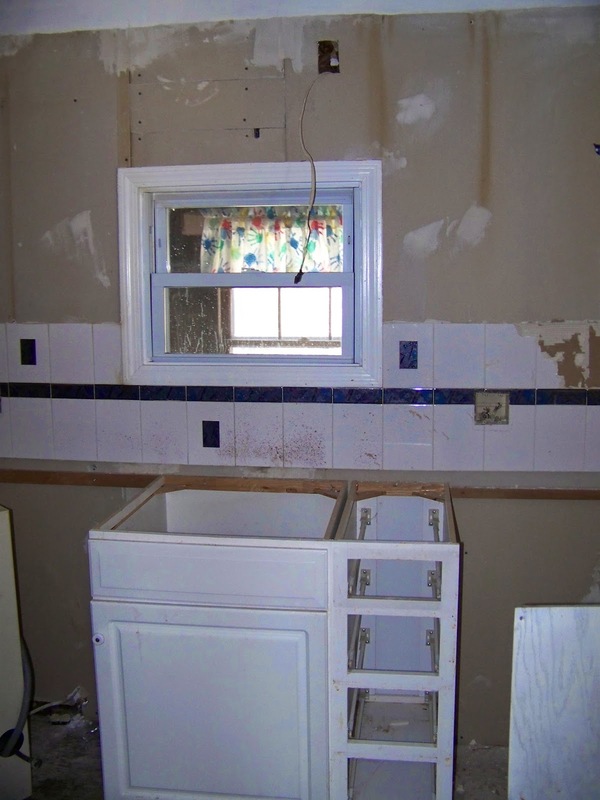 We wanted to move the sink over to that wall, so just a simple "swap" on the two windows was the plan. 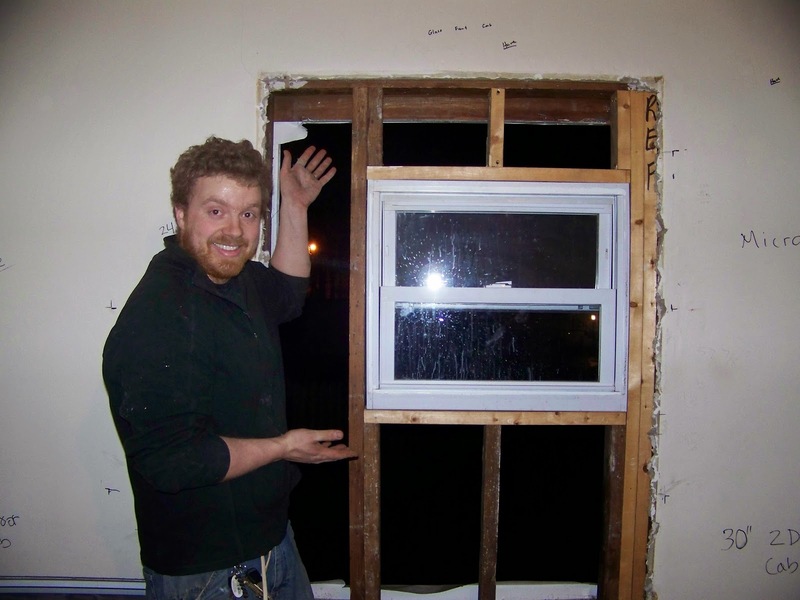 First, we needed to (carefully) remove both windows. 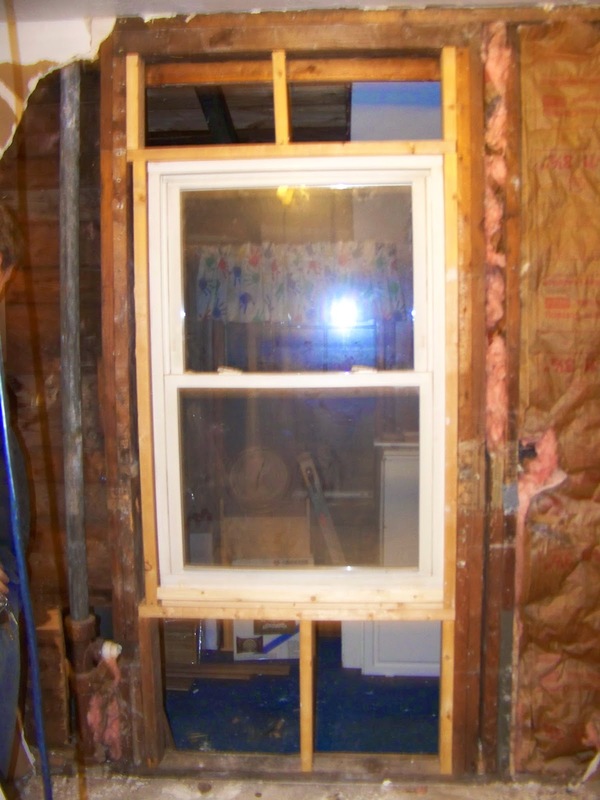 This is the old dining room window (you can see markings all around for where the cabinets would go, and the small window from the old kitchen sitting on the ground). Now we just needed to frame out the small window. 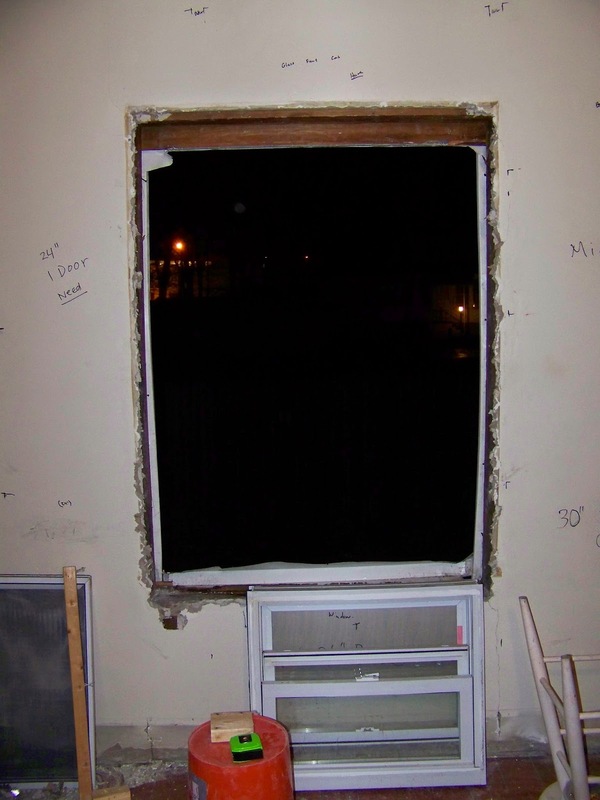 This was easier because the studs were already reinforced to push the load around the bigger window, so none of these studs were load bearing. Even though it was late, we needed to finish up the space, so I quickly cut some plywood and we paused for the night. 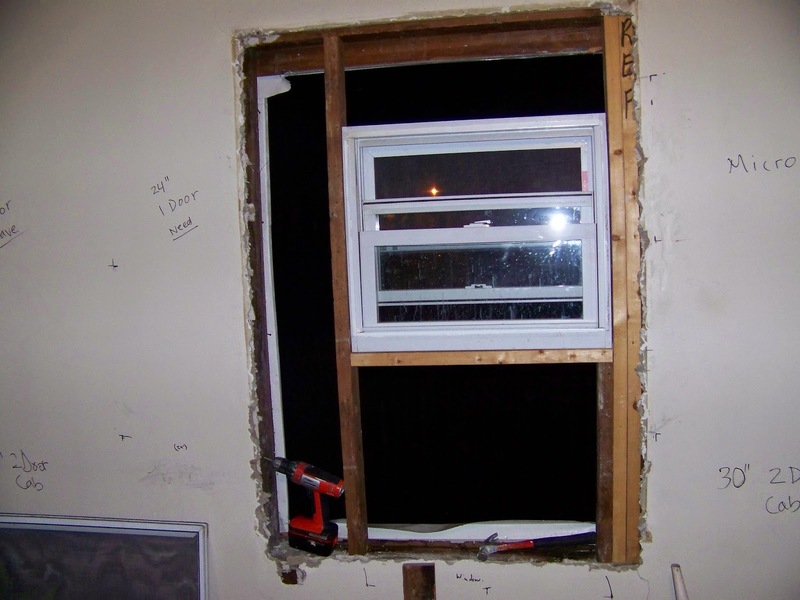 Putting the big window from the old dining room into the small window from the old kitchen was a bit trickier. 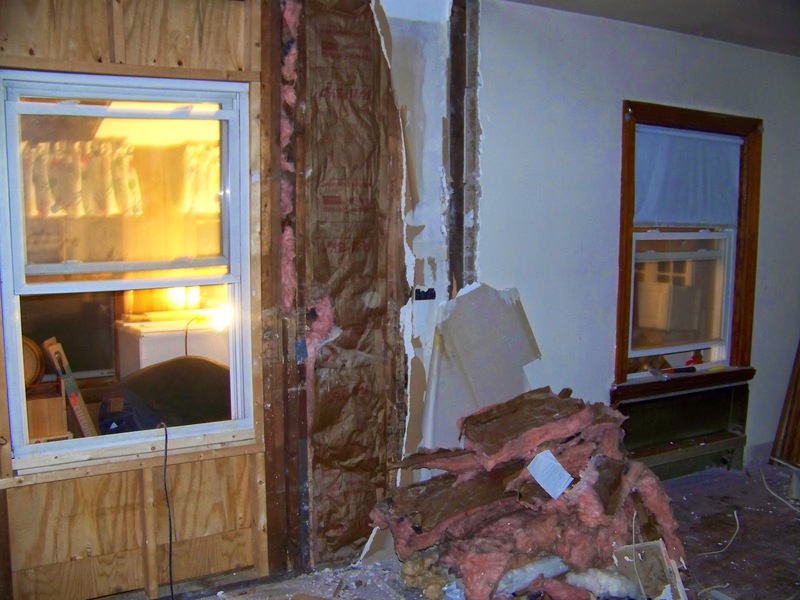 For that, we needed to make sure we were in good shape structurally, so we tore the wall board off and took a good look at the studs. This was also necessary to keep track of plumbing and electrical. 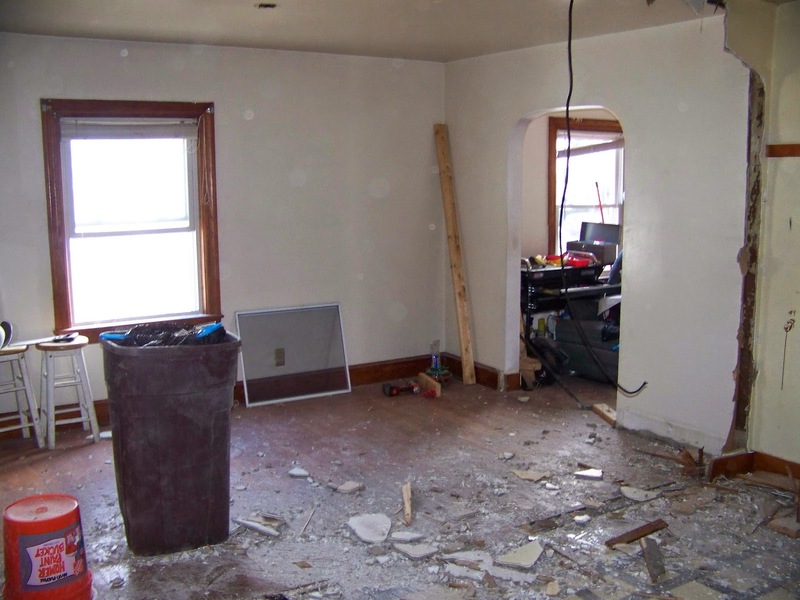 It turns out we were actually undoing an earlier renovation! 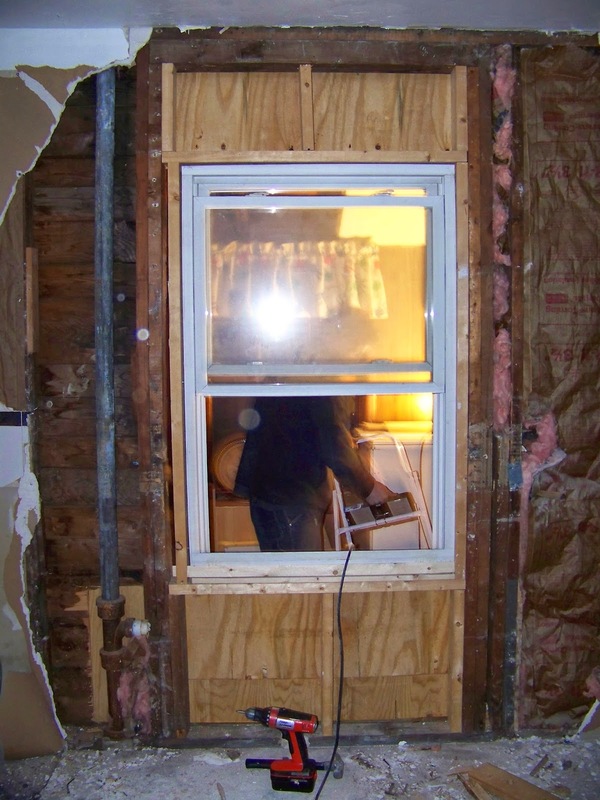 When we looked at it, the space was already framed out for a big window, so it was easy to revert back to the big window opening. 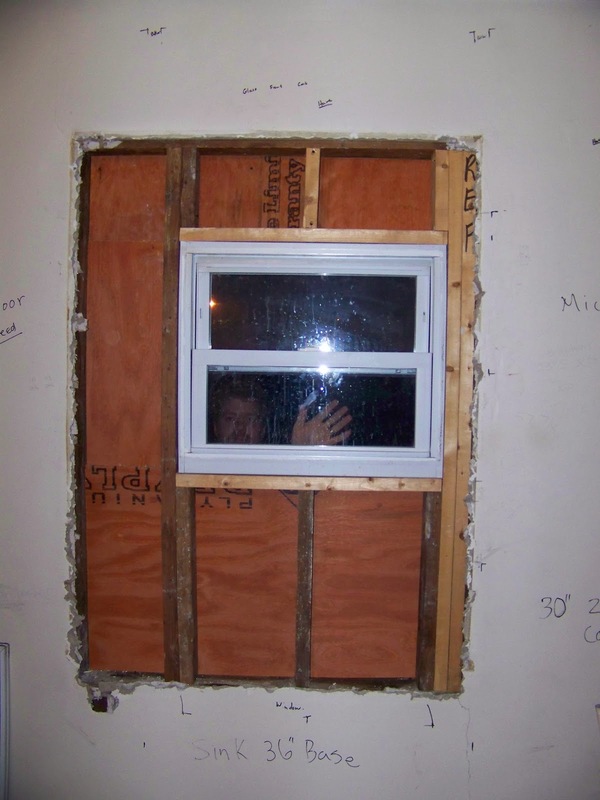 Just a few small studs to secure the window and we were done! A bit of plywood and the holes were patched up. Ok, so I may have been teasing her with treats to get this picture, but she was confused! !